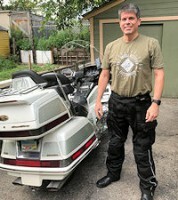 On recent interstate ride on my 1988 gl1500 noticed after loss of rear brakes that I had oil all over back wheel, swing arm, muffler and inside mudguard. After cleaning only source I could identify was from one of the breather tubes in front of the swing arm. I had fitted a new Barnett clutch kit prior to leaving as the original clutch was slipping and difficult to select neutral while engine running. The master and slave cylinders were also kitted and cover gasket and seal replaced. The bike has been sitting unused for a very long time prior to my restoration and I have added 4000klms to the original 45000klms since the bike was back on road. Could oil be coming from clutch due to scavenging pump not working? Further to above, when clutch cover was removed the oil that came out was really black even though engine oil has been changed twice since restoration. Are you sure it is not coming from the rear area like the final drive gear box breather, rear shock absorber pressure release valve etc? Also, if it is coming from the left side under the engine block, the shift lever seal or the alternator seal might be the culprit. I am haveing this issue ( i believe) i have excess oil building in the breather box forcing oil into the air filter box and spraying out any non airtight seal after the breather box itself. Have you found the fix? Fyi: this all happened after i had the clutch replaced. Have you drained your breather tubes?